Adeline Pew, age 87, of Wilmot died March 18, 2018, at Wilmot Care Center. Funeral services will be held on Saturday, March 24, at 2:00 p.m. at Trinity Lutheran Church in Corona. Rev. Caleb Schewe will officiate and burial will be in the Garfield Lutheran Cemetery. Visitation will be at Mundwiler Funeral Home on Friday from 5 – 7 p.m. and continue at the church on Saturday, one hour prior to the service. The organist will be Corrine Hanson. Casket bearers will be: Paul Orcutt, Brian DeBoer, Scott Rust, Jason DeBoer, Bryan Lambrechts, and Marty Buttke. 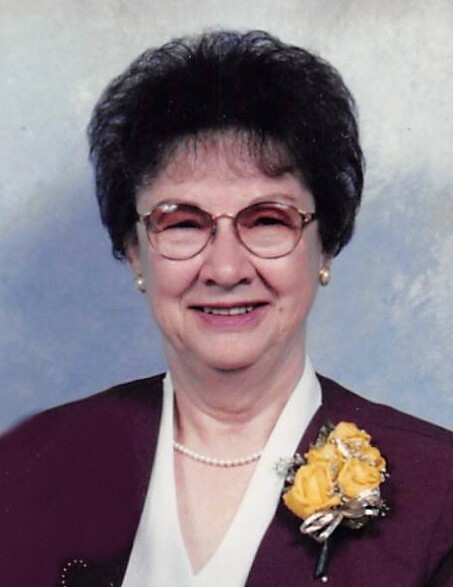 Adeline Ruth (Schultz) Pew was born on January 15, 1931, at Ortonville, Minnesota. She was the daughter of Herman and Lydia (Frerichs) Schultz. Adeline was raised on a farm near Corona. She attended grade school at Garfield #2 in rural Corona. She graduated from Wilmot High School with the Class of 1949. Adeline was united in marriage with Stanley Pew on December 6, 1949. Adeline and Stanley lived in rural Corona. She was a housewife and a mother of three children. She worked at the Corona School and also volunteered at the Thrift Store in Milbank. Adeline enjoyed flower gardening, rummaging, bowling, and cards. Most important was time spent with her husband of almost 65 years, her children, and grandchildren. She made delicious pies and enjoyed collecting hankies of all sorts. She had several hundred in her collection! Adeline and Stanley enjoyed several winters at their home in Texas. She was a faithful member of Trinity Lutheran Church in Corona. She was a member of Dorcas Ladies Aid. Adeline suffered a brain aneurysm in October of 2006. She was lovingly cared for by her husband for 5.5 years. She moved into the Wilmot Care Center in March of 2012. Stanley died on October 29, 2014. Left to cherish her memory are her children: Steve Pew of Milbank, SD; Larry Pew of Bremerton, WA; Joyce (Daniel) Hanson of Wilmot, SD; four grandchildren: Sharlene (Paul) Orcutt of Marion, SD; Stacey (Brian) DeBoer of Corona, SD; Sarah (Scott) Rust of Brandon, SD; and Christopher (Crystal) Bergley of Moscow, ID; nine great-grandchildren; sister, Arlys (Duane) Lambrechts of Milbank, SD; sisters-in-law: Verna Schultz of Clinton, MN; and Beverly Andersen of Florence, CO; as well as nieces and nephews. She was preceded in death by her parents; husband; and brother, Norman Schultz.